Do you love metal AND punk rock? Well, so do we. 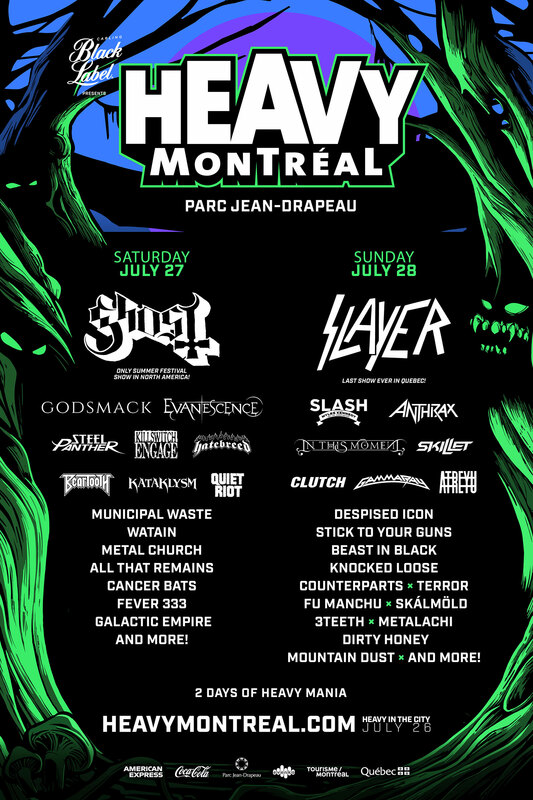 That’s why ‘77 Montreal and Heavy Montreal are joining forces to offer you a special “Weekend Warrior” 3-Day COMBO festival pass so you can attend both festivals and mosh all weekend long. Gold festival pass for '77 Montreal on Friday, July 26 at Parc Jean-Drapeau. Gold festival pass for Heavy Montreal on Saturday, July 27 and Sunday, July 28 at Parc Jean-Drapeau. This premium pass includes access to the GOLD TERRASSE, an exclusive viewing area with a premium view of the main stage, with access to private washrooms and exclusive food & beverage stands. This pass is an RFID bracelet. General Admission festival pass for '77 Montreal on Friday, July 26 at Parc Jean-Drapeau. General Admission festival pass for Heavy Montreal on Saturday, July 27 and Sunday, July 28 at Parc Jean-Drapeau.